Snowy white peaks, crisp mountain air, and the hopes of spotting a brown bear or two? Rocky Mountain National Park (RMNP) is absolutely perfect for an autumnal getaway in the mountains and better yet, it’s easy to get to and boasts a HUGE variety of hikes for all types of fitness levels. While RMNP is a massive park (102,495 square miles) with multiple points of entry, I recommend visiting via Estes Park, an adorable basecamp, stuffed with A-frame cabins and quaint ice cream shops. Not only is Estes Park bursting with small mountain town charm, it also conveniently has some really great vegan options. As eating vegan at National Parks can be a bit of a scavenger hunt (Grand Canyon, I’m looking at you), Estes Park’s proximity to RMNP will ensure that hiking up a mountain (and not finding some delicious grub) is the most strenuous part of your weekend. So without further adieu, here is my itinerary for a quick weekend getaway to Rocky Mountain National Park. While most National Parks are technically open all year round, many roads and trails in RMNP are closed from around late-October until mid-May, due to snow and icy conditions. So before you buy those plane tickets, consider what sort of weather and crowds you want to deal with (June through September are the busiest). We went in late October and since we just missed the fall foliage and it was a bit too cold at times for my liking (it had literally snowed a foot the weekend before we arrived! ), I think September would probably be the best time to head to RMNP. Once those tickets are booked, you’ll fly into Denver International Airport- on one hand, this airport is great as a ton of budget airlines seem to fly there direct (at least from St. Louis, our round trip tickets were around $120); on the other hand, the airport was large and a bit confusing to navigate. Since it’s located about forty minutes outside of Denver and about an hour and a half away from Estes Park, you will need a rental car as well. Along with the confusing airport layout, we also had to wait a pretty significant amount of time for a shuttle to get to the rental car facility so if you need to be any place by a certain time, make sure to give yourself plenty of time to get through the airport. If you get there early on Friday, I absolutely recommend exploring Denver for the day. For this trip, I went with my husband, Justin, and one of his coworker friends and we all had to work remotely during our time in Denver. However, I’ve been there several times previously and can attest that they have a killer art museum (Denver Art Museum), more craft breweries than you can shake a stick at (Cerveceria Colorado and Alternation Brewing Company, which has a vegan milk stout, are definitely worth a stop or if you’re looking for something totally different, check out Dos Luces Brewery!) and plenty of $4 tickets to a Rockies baseball game. Due to our working schedules, we really only had time for dinner and drinks in Denver and since we were with an omnivore friend with much different dietary preferences than my husband and me, we checked out some places we probably would not have otherwise (which is great!). We had pre-dinner fancy cocktails at Urban Farmer (1600 17th St, Denver, CO 80202)- while the food menu is FAR from vegan-friendly, the cocktails were delicious, the atmosphere was impossibly hip (complete with a David Bowie quote emblazoned in neon lights), and the service was impeccable. Try to get there for happy hour between 3-6 pm for $5 Old Fashioneds! Following our cocktails, we had dinner had Blue Sushi Sake Grill (1616 16th Street, Denver, CO). Prior to being vegan, I was a pretty big fan of sushi and now, find myself wishing there were better vegan alternatives out there. Thanks to Blue Sushi, I was BLOWN away by their carefully curated (and clearly marked!) menu with tons and tons of options (11 types of rolls at my count!). And I’m not talking about some simple boring cucumber rolls- we’re talking inventive combinations (for example, the Cowgirl featured pickle vegan tempura, sriracha-fried onion rings, vegan mayo, and barbecue paper). So good! If we had extra time, I would’ve loved to stop by Grandma’s House, a taproom themed around (you guessed it!) our favorite grannies, complete with crocheted blankets and all the tschotskes one could ask for. Instead of embracing my love of all things kitsch, we started the hour and a half drive to Estes Park so we could hit Rocky Mountain bright and early in the morning. Next time, Denver! Proptip- cell reception en route from Denver to Estes Park is spotty, at best, so I would definitely recommend downloading offline maps, podcasts, and whatever else you need to accompany your drive to the mountains. 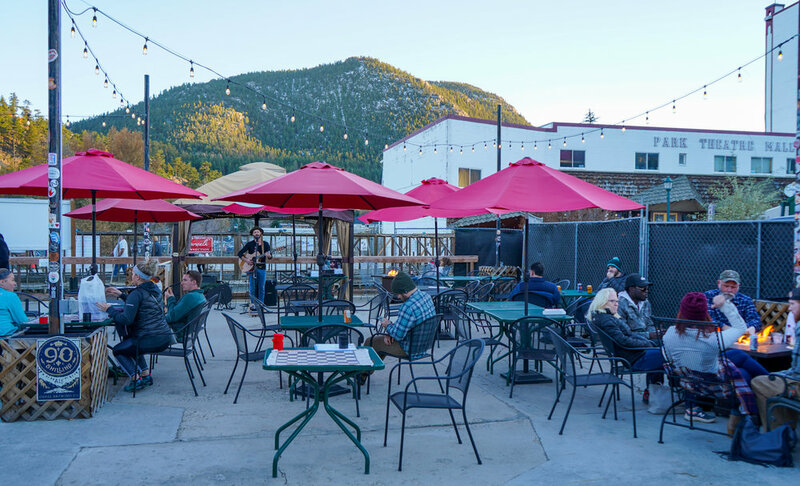 Sitting just minutes outside of RMNP, Estes Park is an adorable little town with local gift shops, restaurants, and tons of cute bars. While hotel rooms are plentiful (you can even snag Room 217 of the Stanley Hotel, made famous in The Shining! ), I would recommend fully leaning into the mountain getaway experience and renting a cabin (available via Airbnb or on an independent basis). We stayed at RiverSpruce and were pleased with the accommodations, complete with our own private hot tub, river-side fire pit, and these gorgeous views all to ourselves. Breakfast is often the most challenging meal for vegans to find a breadth of options; however, Notchtop Bakery and Cafe (459 E Wonderview Ave #4, Estes Park, CO 80517; 7 AM- 3 PM daily), conveniently located in downtown Estes Park, offers a TON of veganizable options- for pretty much any dish made with eggs (think breakfast burrito; sandwiches, and skillets), they are more than happy to replace it with scrambled tofu (or if you’re feeling really saucy in the AM, you can try out their Cajun tofu). If you’re one to avoid soy, they also have a few other breakfast options, like a pineapple oatmeal dish made with coconut milk. They also had some really great lunch options when we were there as well (I’m talking Impossible Burger great), so this might be a great option for a post-hike meal as well. Notchtop was PACKED by the time we finished our breakfast (around 9 am), so I would definitely recommend hitting this spot as early as possible. From breakfast, we headed straight to RMNP via the Beaver Meadows entrance (the most common way to enter from Estes Park)- while the line of cars to get into the park was already pretty long by the time we got there (around 9:30), we got to zip through an express line with my beloved National Parks Annual Pass (a one-time $80 purchase that gets you into all of the national parks for a year for free). Without the pass, it costs $25 for a vehicle to enter the park. There are no accommodations or grocery stores inside RMNP, so if you need to pick up ANYTHING for your day in the park (for example, sunscreen, hiking snacks, or water), make sure you stop on your way through town entering the park. Confusingly, the Beaver Creek Visitor’s Center is located right outside of the park entrance (which has a limited and expensive supply of basic hiking gear), so if you need to run out to buy something from it, you are going to be forced to wait in the line of cars again. Unlike some other parks, RMNP has only one dining option inside the park, the Café at Trail Ridge, which is open mid-May through Mid-October. Since we went near the end of October, the restaurant was closed for the year and, as no menu is posted online, I’m not sure what the options are (although the website lists the cafe as offering sandwiches and hot dogs isn’t exactly promising). If you’re going to be in the park for any meaningful length of time, I would recommend picking up some tried and true hiking snacks, like Clif Bars or Uncrustables and PLENTY of water. If you’re from a state at or below sea level, like me, the elevation change can leave you quite parched. Also, unlike a lot of other national parks, RMNP does not have potable water at its trailheads (and is generally only available at visitor centers), so plan on bringing in whatever you need. Parking may also be an issue depending on what time of the year and day you head to the park. In peak months (June through September), the parking lots for the most popular trailheads (Glacier Gorge, Bear Lake, and Wild Basin Corridor) can get full by 8 am or earlier. If you’re going to be hiking in the late morning, it may be advisable to take the free hiker’s shuttle from the Estes Park Visitor’s Center. The shuttle runs daily from late May to the mid-September and then weekends only until the first week of October. The first bus leaves the Visitor’s Center at 7:30am, and the last bus returns at 8 pm. It runs every half hour during the peak of the day (10am - 6pm), and every hour early and late. Since we went pretty late in the season, we lucked out and found a spot in the Bear Lake parking lot, but we saw plenty of people relying on the shuttle system running through the park. RMNP has 355 miles of hiking trails, varying from wheelchair accessible paved trails to hikes that boast some 3,100 feet of elevation gain. We wanted a more strenuous hike when we went and after studying reviews on All Trails, we picked Sky Pond via Glacier Gorge Trail, an 8.1 mile, out-and-back hike. This trail features two waterfalls, two lakes, sheer cliffs, jaw-dropping views- need I say more? The trail is rated as “difficult”, but to be honest, until the last mile, I would definitely categorize this as a “moderate” hike (i.e. definitely still a great cardio workout, but nothing a person who is reasonably in shape couldn’t handle). I can’t stress enough how important dressing and packing appropriately for the conditions is- in late October, about four inches of snow layered the ground for portions of the hike and to get to the end of the hike, you need to scramble up icy rocks near a waterfall. Since no one in our party brought gloves, let alone crampons, we weren’t able to finish the hike and didn’t get to catch the lookout that one of the returning hikers we ran into called “the most stunning view in the forty years” the gentleman had been hiking around the world. Travel blogger fail. And while I’m telling you to bring crampons on one hand, you should also prepare to get HOT while hiking- I wore a full parka, sweater, and long johns for a portion of the hike and literally rocked a tank top for a decent amount of the hike. Like a Boy Scout, we should always be prepared. If scrambling up icy rocks amidst sheer cliffs isn’t necessarily your bag, you should definitely make time to stop by Bear Lake, which in my opinion, is the hike with the best bang for your physical exertion buck I have ever experienced. Literally steps away from its parking lot, a flat 0.7-mile loop leads around a deep blue lake, perfectly reflecting the snow-capped mountains above. This would be a great hike to do with kids, with multiple signs highlighting the diverse ecology along the path and a mostly-stroller friendly path (note that the path gets steep in a few sections but quickly levels out). After about six or so hours in the park, it was starting to get dark in the mountains, so we headed back to town. The downtown area spans three or so blocks down the main drag, Elkhorn Avenue, and is easily explored in a couple of hours. Stand-out stores for me were Earthwood Collections, with local blown glass, pottery, and other artworks; Snowy Peaks Winery (who knew that Coloradans could make wine? ); and MacDonald Book Shop, a cute tiny independent bookstore with a few curated gift items. After spending some time perusing the stores, I turned to my fellow travelers and said “Man, all I want to do is sit outside with a beer, listen to some music, and stare at the mountains.” Suddenly, acoustic ‘90s music started wafting towards us and we followed the sweet sounds of a maudlin cover of Eagle-Eye Cherry to the aptly named bar, The Slab (116 E Elkhorn Ave Box 3052, Estes Park, CO 80517). The bar is super simple concept- basically a gigantic patio (meaning there is no indoor seating), with standard metal patio furniture and a few fire pit tables scattered about, serving locally-brewed canned beer from a little stand. 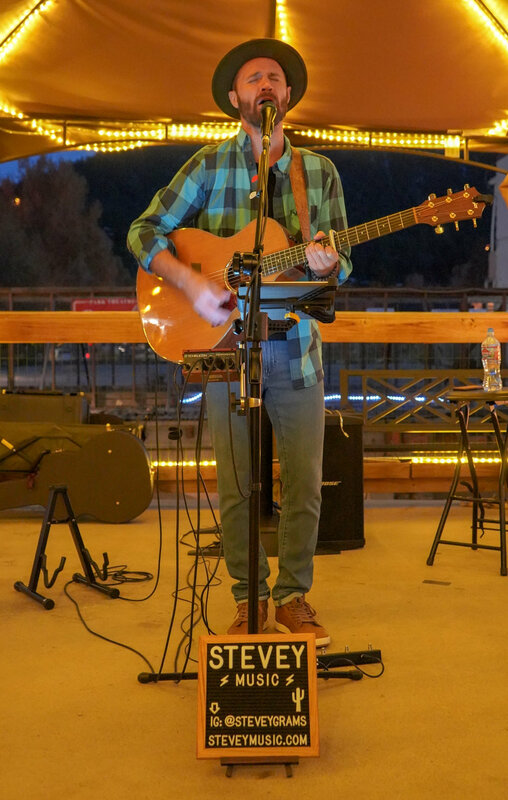 While completely minimalistic in nature, the Slab also hosts live music several nights a week and boasts a fabulous view of the Rocky Mountains. Beer, music, mountains? Count me in! Usually when I’m traveling somewhere, I try to pack the most experiences in as possible and rarely stay at an establishment for more than one drink, but we wound up hanging out at The Slab for hours, joking with the live musician (who was great! ), warming our hands on the fire, petting the pups hanging out at our neighbors’ tables, and just enjoying each others’ company. While I would DEFINITELY recommend snagging one of the coveted fire pit tables as soon as possible (which will help combat the chilly night air), this is a perfect place to unwind after your arduous day of hiking. Again, faced with the challenge of finding a restaurant that catered to both our friend’s dietary restrictions as well as our own, we wound up choosing an old vegan standby- the beloved family Mexican restaurant. I recalled that Casa Grande (220 E Elkhorn Ave, Estes Park, CO 80517) was listed on Happy Cow (an awesome resource for vegan-friendly restaurants) so we stopped in to get dinner there. Truthfully, the options were limited to a black bean and vegetable burrito, but the margaritas were strong; the chips were served hot, with a delightfully spicy salsa (and were free, which is a dying breed in Mexican restaurants); and the service was quick and attentive. Admittedly, I wasn’t getting any cell service in Estes Park and I had actually meant to get dinner at a different Mexican restaurant (Ed’s Cantina and Grill), which has an entirely separate vegan menu (travel blogger fail 2.0). 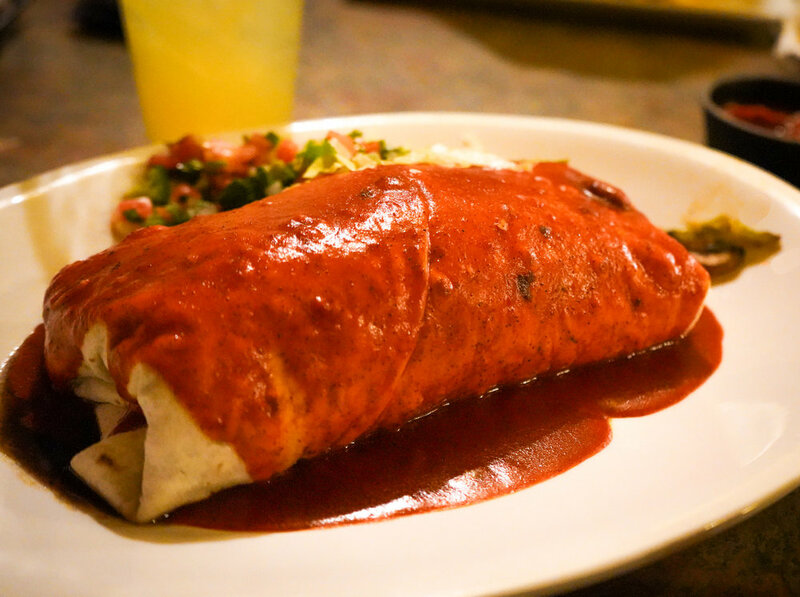 I’d definitely love to try Ed’s next time, but in a pinch (or, you know, a cell phone Internet outage), Casa Grande’s massive and tasty burrito certainly hit the spot. After dinner, we headed back to the cabin, promptly climbed into our hot tub, and stared at the stunningly bright stars for hours. 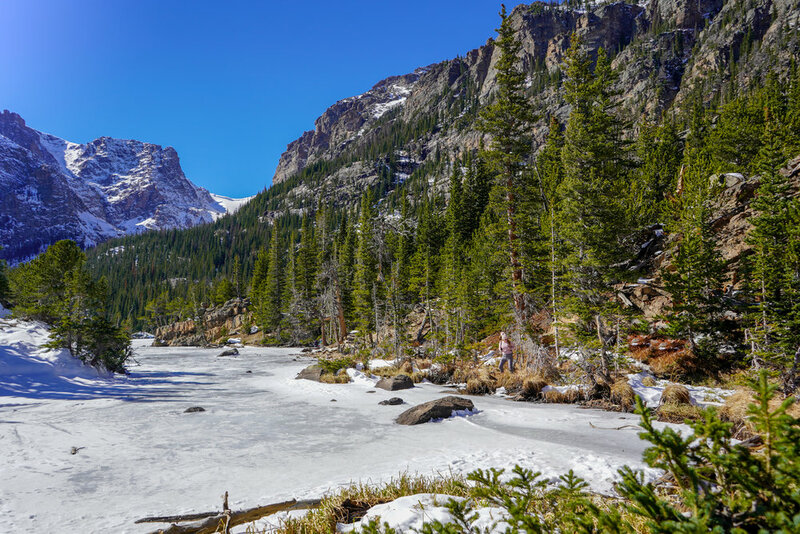 Every aspect of Estes Park is gorgeous, from the breathtaking mountains to the crystal clear night sky;I would recommend arranging your itinerary to take advantage of this as much as possible (especially if it involves sitting in a hot tub on a cold snowy night). If we had more time before our Sunday flight home, I would have loved to head back to RMNP and try another short hike, like the 3.5 mile trek to Emerald Lake or the 4.0 mile hike to the Ute Trail, but alas, our time in the mountains was limited. Instead, we headed straight to the airport, stopping to pick up breakfast along the way at Woodgrain Bagels, located in Boulder (2525 Arapahoe Ave., Boulder, CO). Woodgrain has plump (you guessed it) wood-fired bagels and paired with the delicious vegan cream cheese and assortments of savory toppings (think avocado, tempeh bacon, or seitan), this was my bagel-loving husband’s absolute dream. Again, if you have extra time and are all hiked out, Boulder, the adopted home of Jack Kerouac and all around epicenter of the elusive yuppie-hippie elites, is an absolutely fantastic place to explore- I recommend checking out the stunningly intricate Dushanbe Teahouse; have a sensory overload experience at the Celestial Seasonings Tea Tour (it’s free! ); or dropping by The Tune Up, an in-house coffee shop and bar inside of an uber dog-friendly bicycle shop (you pretty much can’t get more Boulder than that). If you don’t have any time for more exploration, head on back to the airport and start dreaming about the next time you’ll conquer the Rockies! 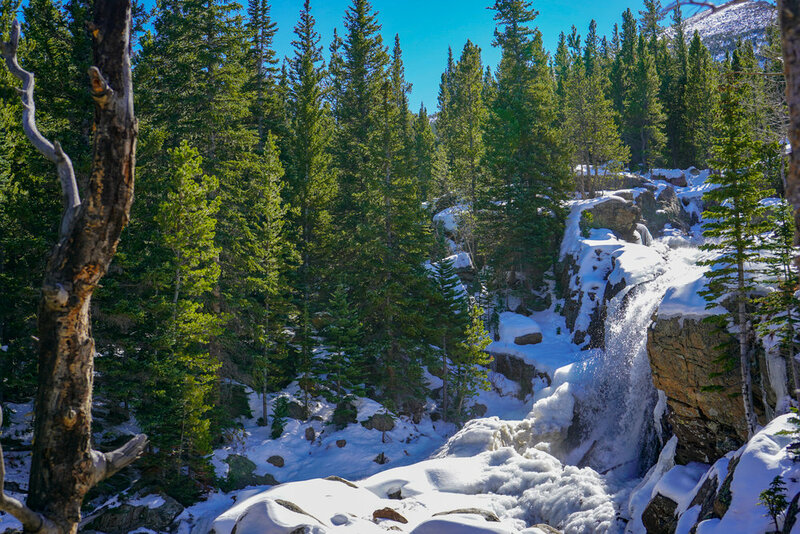 Have you ever been to Rocky Mountain National Park? I’m curious to know what it’s like staying in Grand Lake, RMNP’s other main base camp and would love to hear your experiences in the comments below!